Happy Halloween, Human Friends, Bear Friends, Ghoul Friends and Everyone in between! Admittedly, this year I have been a bit of a Halloween bummer. It completely snuck up on me. There was no costume planning. There was no party planning. I wasn’t one of the people that put out spooky spider webs or cardboard graveyards on their lawn. There was, however, some long pauses made in a very well stocked candy aisle at Target. Oh, and some lingering on Etsy for pet costumes. Nothing was purchased (biggest Halloween regret? Yup.) That is about as far as I went this year. The whole fact that Halloween can sneak up on you is such a grown-up notion. Do you remember when you were a kid? As soon as you had emptied your pillowcase full of candy and strategically hidden all of the snickers bars from your father’s sticky fingers, you had already come up with next years costume. It was never a hassle (for us kids at least… I can’t speak for my Mother and Grandmother who would sew most of my costumes. Thank you, ladies.) It was always fun and always joyous and always meant free candy. See that kid? (Me.) Getting caught red handed in the act of eating candy when her father was trying to give her a bottle. 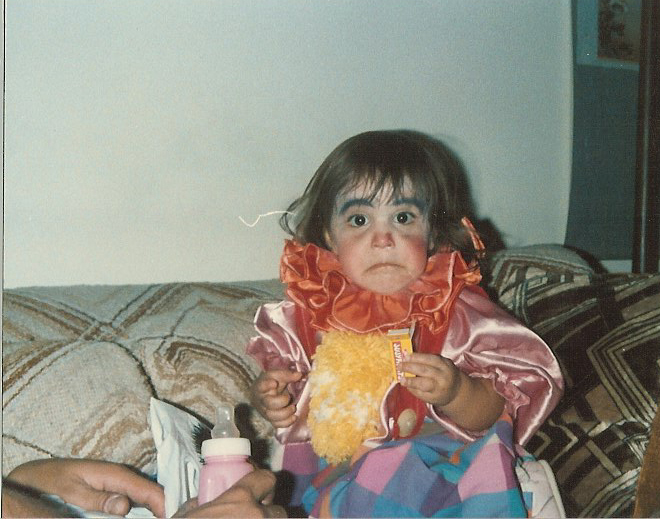 A face full of sweat smeared clown make-up from hitting the mean streets so hard with her candy bag. She knew what was up. Life was easier. This year, after brooding in my Halloween grumpy pants, I decided to just go small and have a nice little pumpkin carving party for two. The husband and me. (admittedly, it turned into three. Emma tried to eat all the pumpkin guts. She also made out with my jack o’lantern. She is kind of easy.) We carved, we laughed, we made some pumpkin seeds. It was good. It made me realize that you don’t have to go big and crazy to get into the spirit. I hope you enjoy our video. A little peek into our humble Halloween with a side of stop motion. Our wonderful and talented friends Ampersand allowed us to use their song to jazz it up a bit. You can find them at their website here. Give them a visit and a listen. 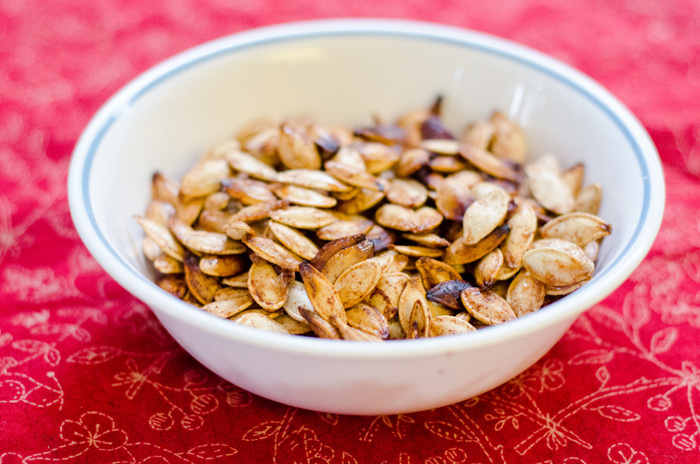 Here is a recipe for our Cinnamon Sugar Pumpkin Seeds. Granted, I will tell you now… It was late, things didn’t get measured and it turned out okay. I advise you, like I did, to just get a little sloppy with it. Be creative. I believe in you. Throw away the measurements. The kitchen is your canvas. They turned out tasty. I only burnt them a little on the edges of the pan. Not everyone is perfect, ya know? Scoop, clean and prep your seeds. After washing them, let them dry for a bit on a plate with paper towels. After your seeds are dry, add them to a mixing bowl. Add in your butter, sugar, cinnamon and vanilla. Mix it all up until your seeds are coated all the way through. Line a pan with parchment paper. Spread out your seeds evenly onto the parchment paper. Put your seeds in the oven. Check them every 10 minutes and give them a bit of a stir so they cook evenly. Do not let them go too long because you are editing a Halloween video. They will burn. Pumpkin seeds wait for no one.